As we are now approching a new year we are looking back to all the projects we made this year for you. 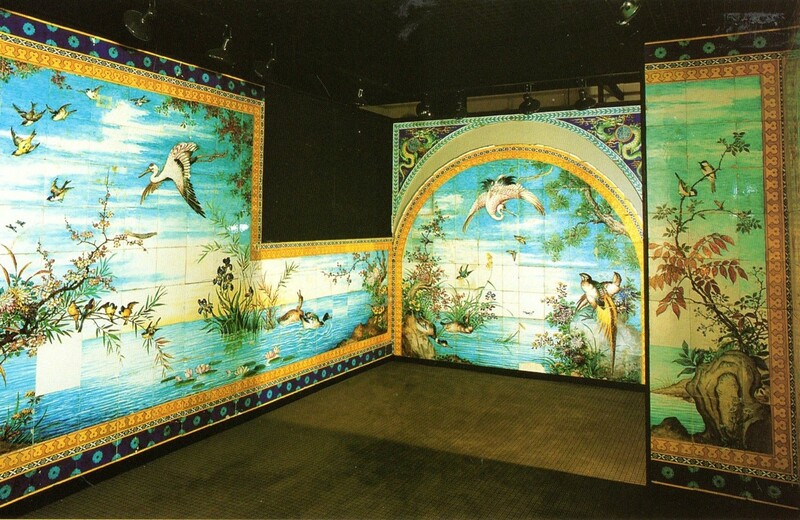 There are small and large hand painted miniature tile wall murals, elegant bathrooms walls, colorful tiles for entrance halls and rustic kitchen floors just to name a few. Some of you sent us pictures of your final project which we proudly present at this site during the year! 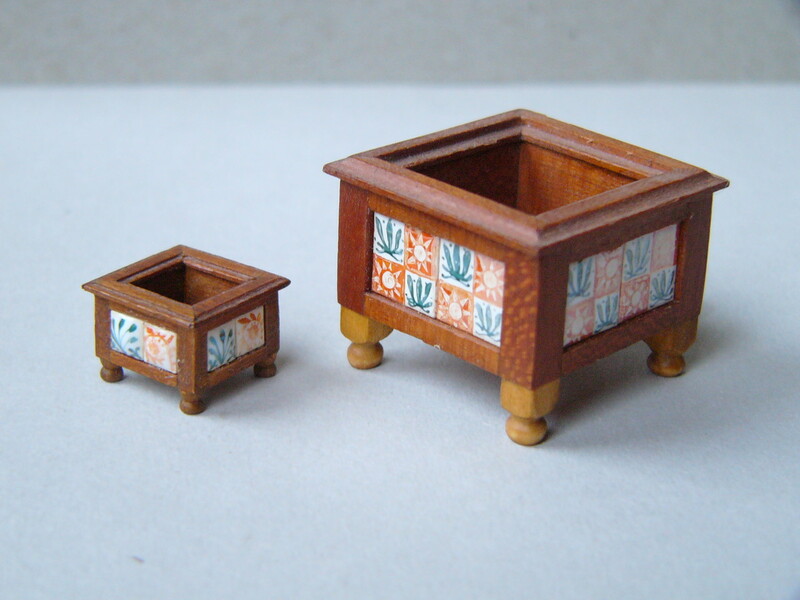 We like making miniature tiles and to assist you finding the right tile for every area in your dollhouse or roombox. 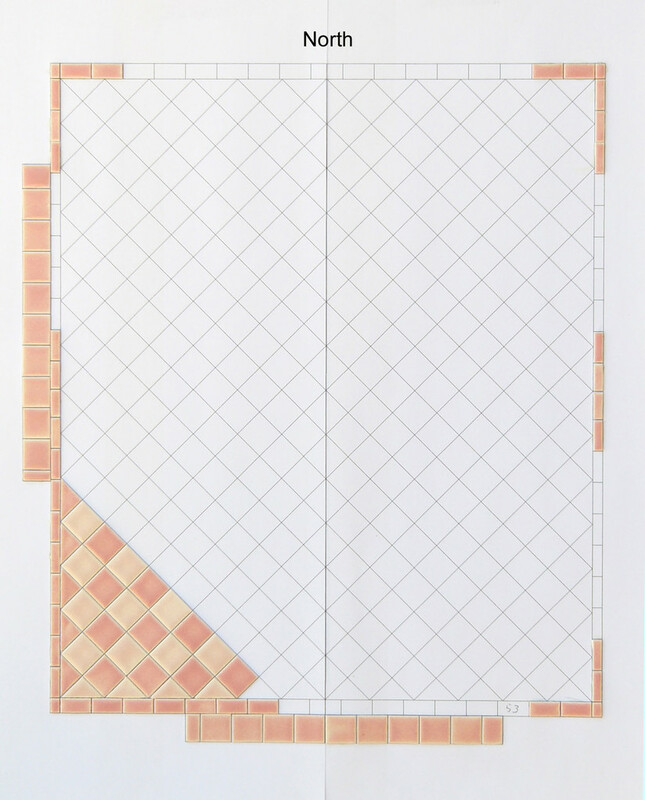 We are thankful to everybody who are interested in our miniature tiles and to those who commited their tiles projects to us! Particularly during the wintertime we enjoy the plants in our homes. 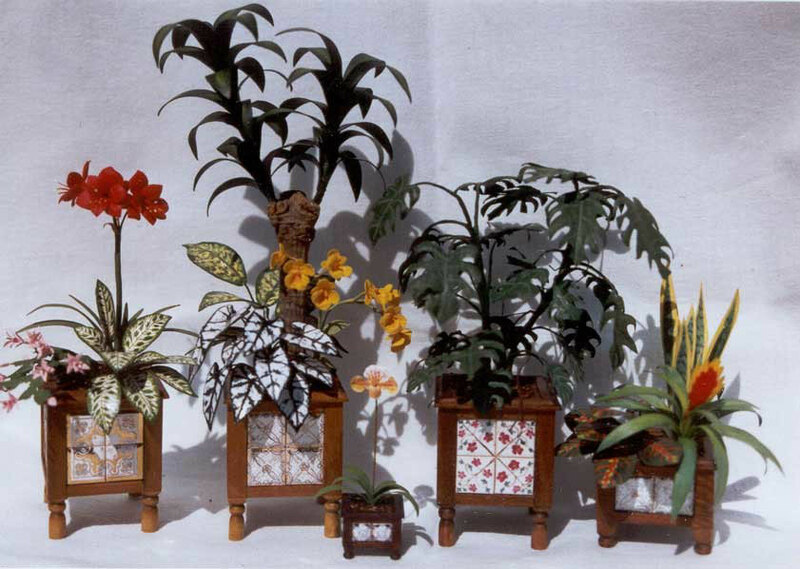 Waldtraut Halfpap made this wonderful miniature plants ready to go in a conservatory. 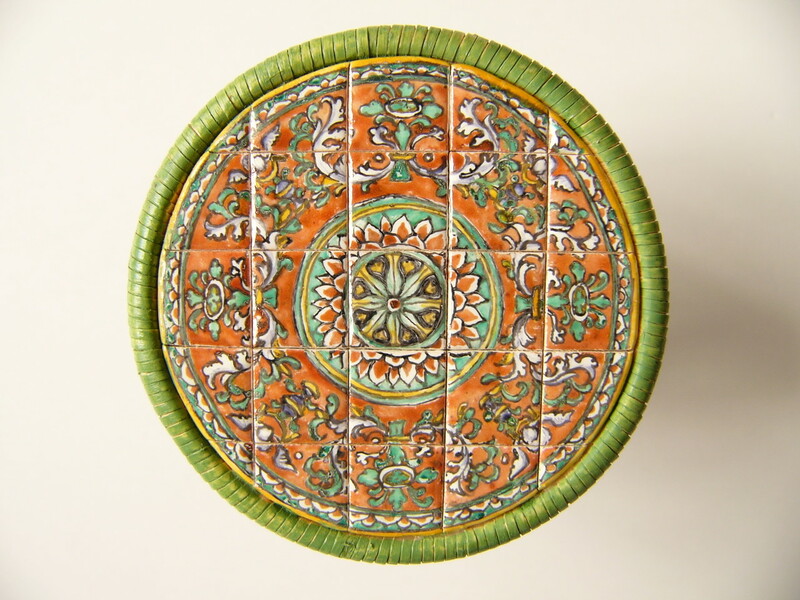 They were 'planted' in wooden planter decorated with hand painted tiles of different sizes and styles. The smalles one to the left is used for 1 inch and 1/2 inch scale as well. 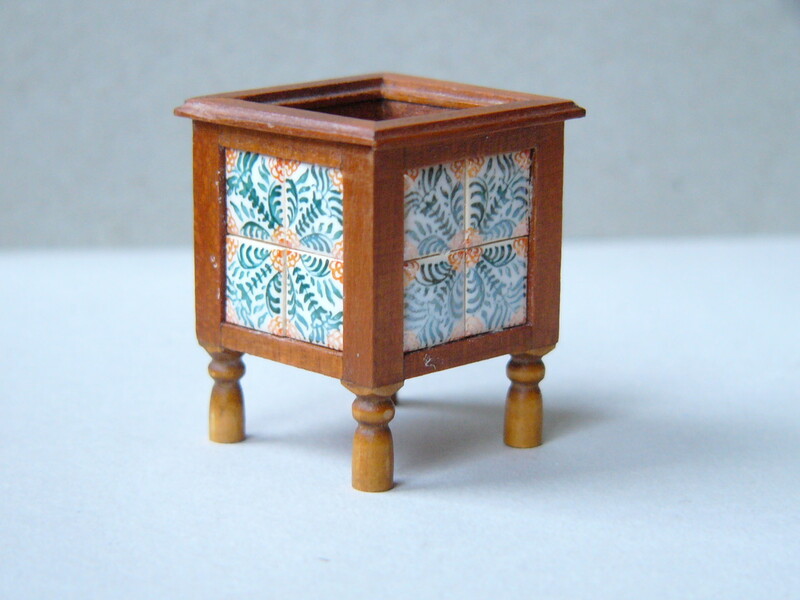 It´s really charming in particular if it is combined with the somewhat larger planter. 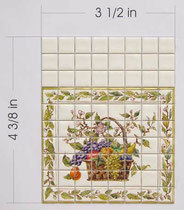 Both items show tiles with de Morgen designs. So does the larger one in the middle. The right one depicts a common midieval pattern. Sophia made an impressive kitchen and liked to get tiles for the area between the lower and upper cupboard as well as over the stove. 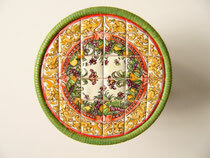 Fruits and a fruitbasket were her favorite designs. 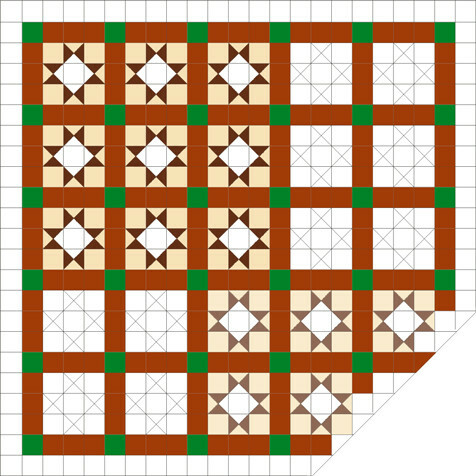 According to the given measurements the we made the tile-layout. After having agreed with Sophia about the amount of hand painted fruit tiles and their distribution we made the tiles accordingly. 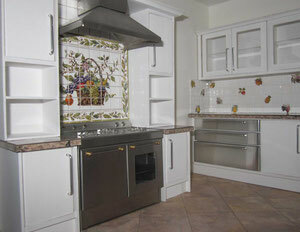 All tiles show a glossy white glaze and were hand painted. Mounted at the envisaged place the arragement looks as it should - made to measure! 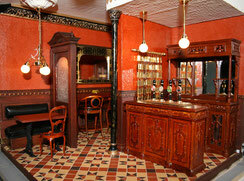 Sybille made a impressing english pub and looked for an appropriate floor. Ver often high fired terra-cotta tiles were used. 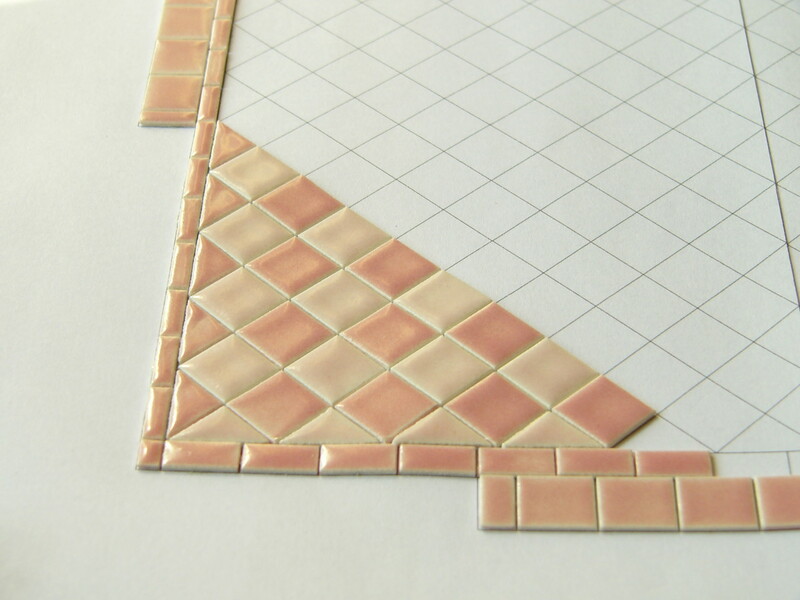 The pattern consit of square tiles, triangles and half triangles in straight or diamond setting as you can see on the two left prictues. 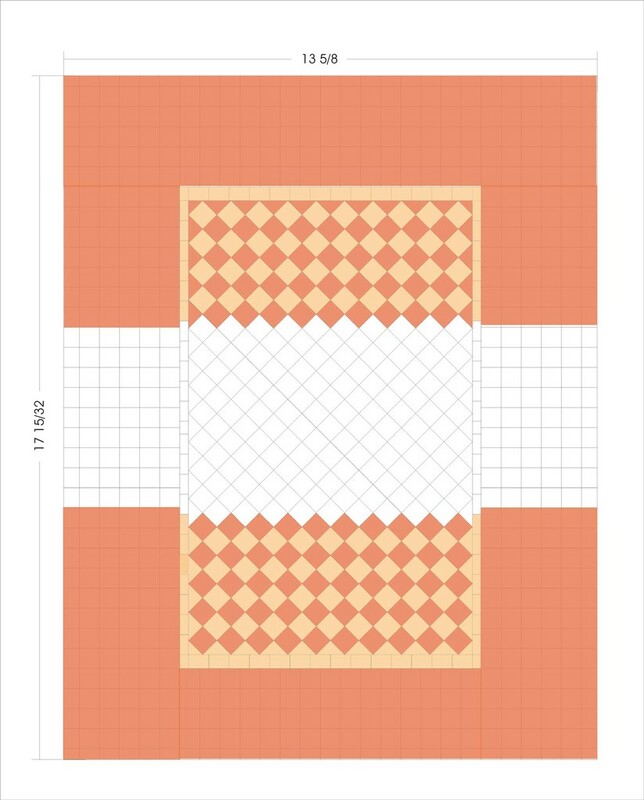 Sybille selected one of the suggested basic pattern. 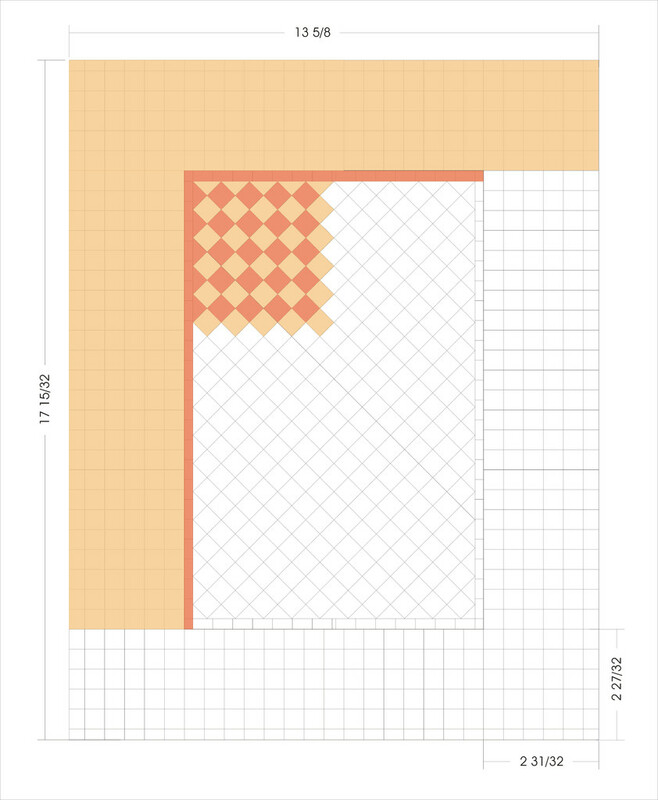 As the floor was cut diagonally at the enctrance section, it took some thoughts to find a good looking layout. Sybille goes for the right one as it is less strict. Now please look at the color variation. 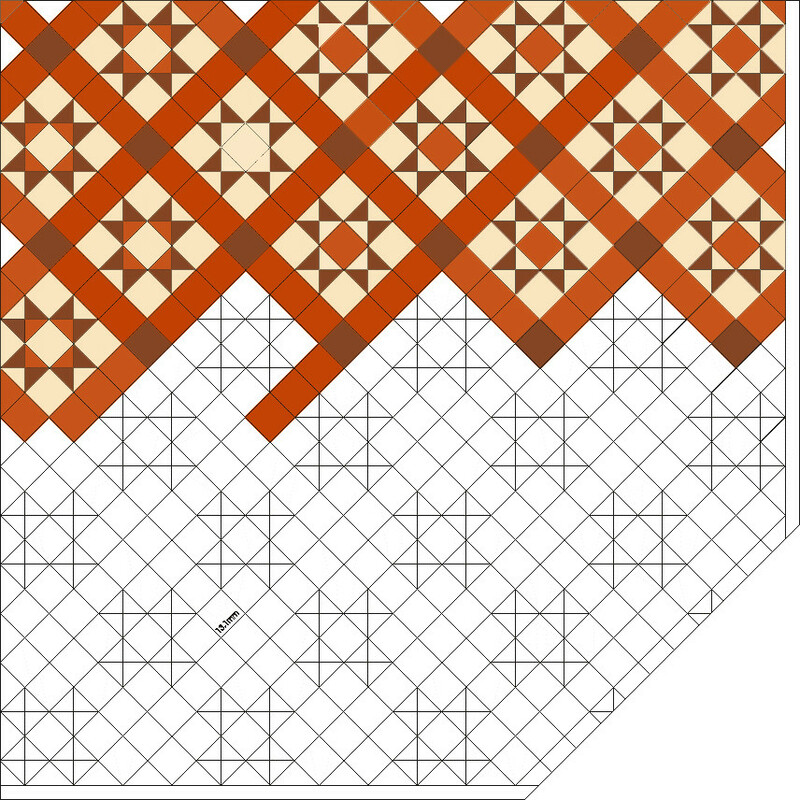 In the left section there are yellow tiles in the centre of the single units and on the right one there are red tiles. 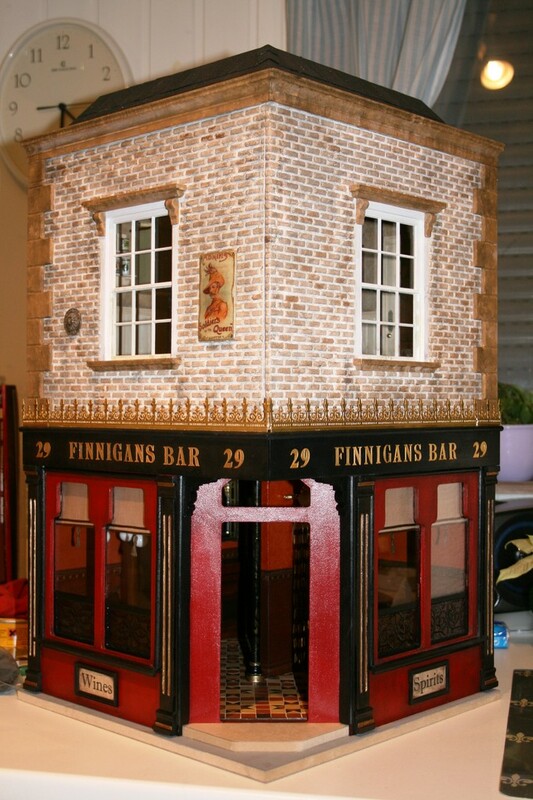 This is the final pub. As you can see Sybille desided to take the pattern with the yellow centre. Sybille followed our recommendations and sandpapered the surface after having fixed the floor in the room. Besides she applied a very thin film of beewax on it. It looks so realistic, doesn´t it? A bathroom in a feninie style! That was the desire when Barbara contacted us. 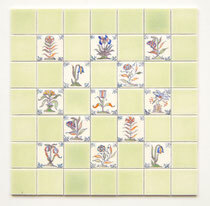 Therefor she selected rose and bordeau tiles and she liked to get a a rim of roses to enbroider the walls. The main point which has to be considered while doing the layout was the fact that the ceiling comes down at the north wall. 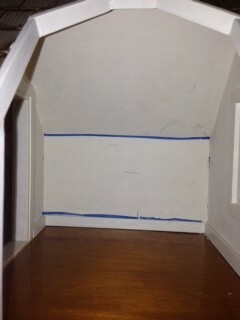 Subsequently the hight of the tiled area was limited by the ceiling and the baseboard at the bottom. 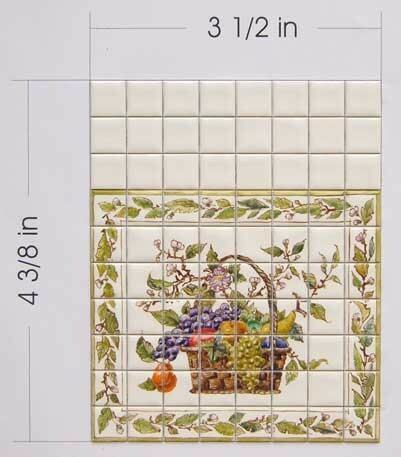 To the right can see the suggestions for the top rim: either 3 rows of hand painted roses or 2 rows framed by a top and bottem line of 1/2 tiles. Below you can see what Barbara had chosen and what we finally made. 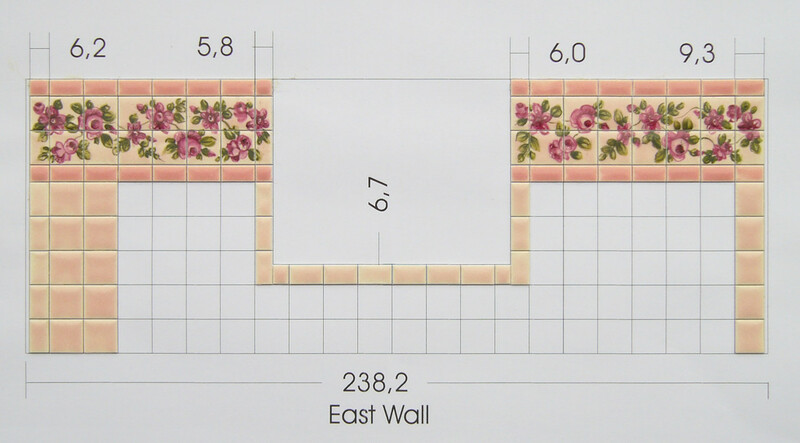 As usual we supply the plans for the floor and the walls as well as the tiles. 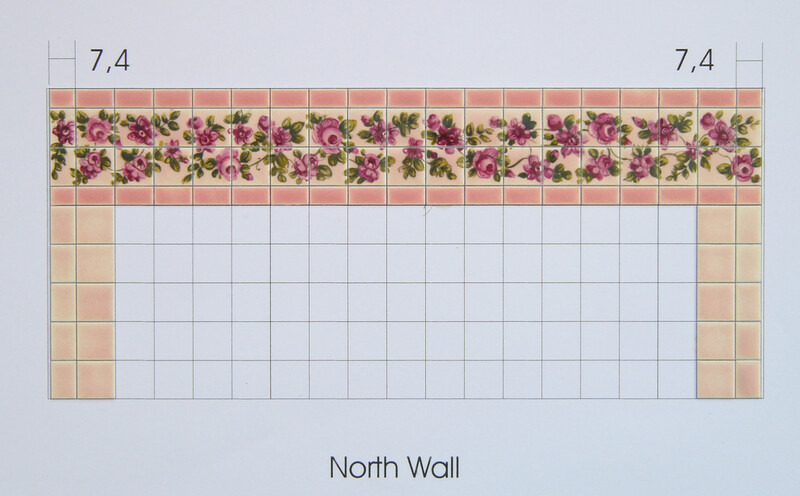 The tiles show a soft silk mat surface and the roses are all hand painted! Horst had already glued the rims and some of the areas with special shaped tiles and you can virtually see how lovely the bathroom will be! Now it is on you Barbara to go on! It was a pleasure to work with you on that unique und very feminie bathroom! Thank you very much! 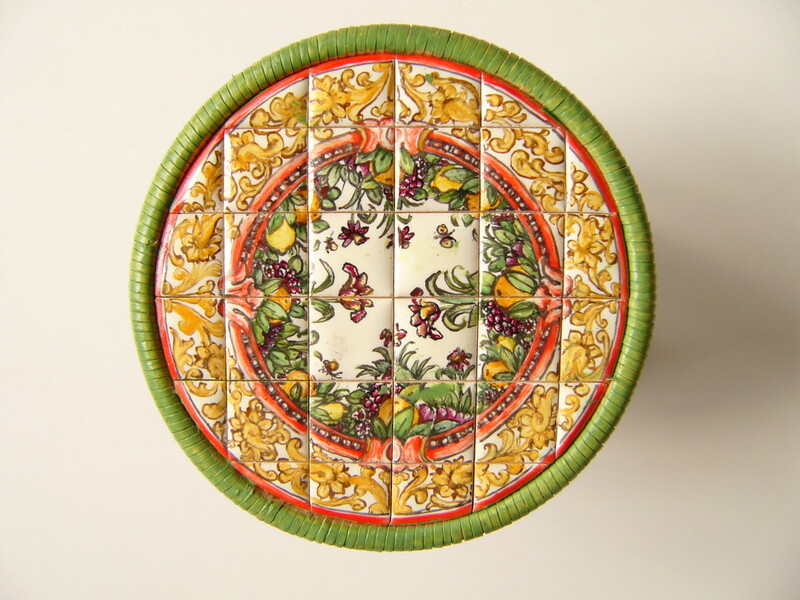 Theodore Deck was a french ceramic artist and ceramic technican, a very rare combination. 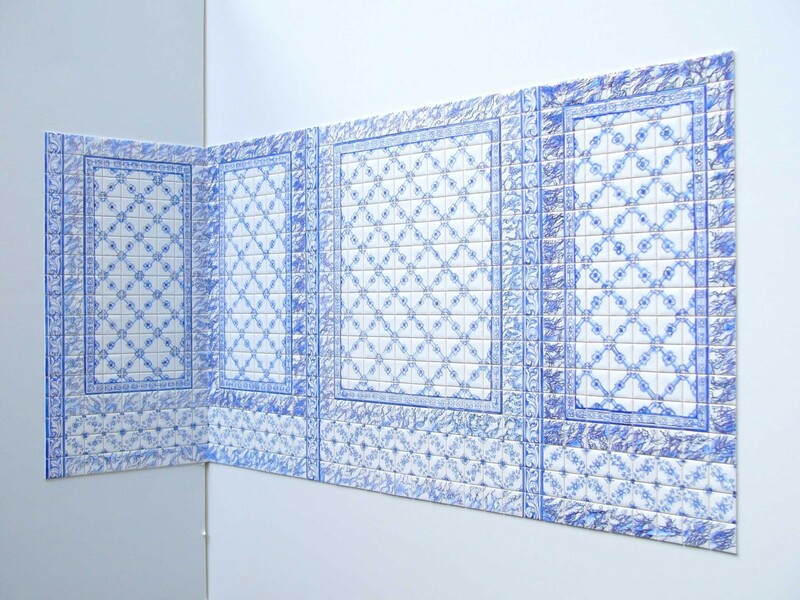 In 1876 for the indoor swimming pool in the privat 'Villa Schlumberger' Deck and his collegue Lachenal made this outstanding 'modern' tiled wall (left picture) which can be admired in the Town Museum of Guebwiller in France today. On the right side you see the miniature wall mural we made and painted accordingly. We love the way how Deck and his friend painted european landscape and animals in an acian inspired way. Please look at the details! 6 11/12 inches x 6 inches. 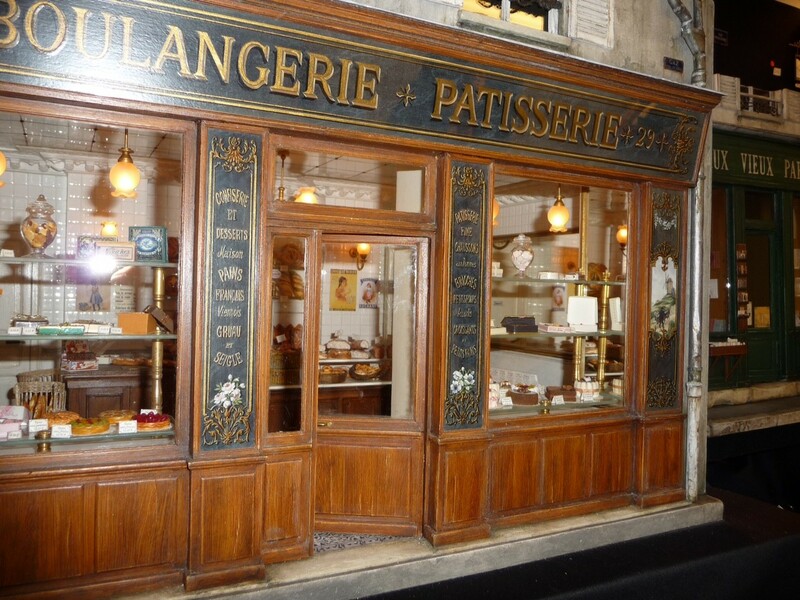 This wonderful bakery was a commission Catherine and Mylène made for a customer in the Near East. 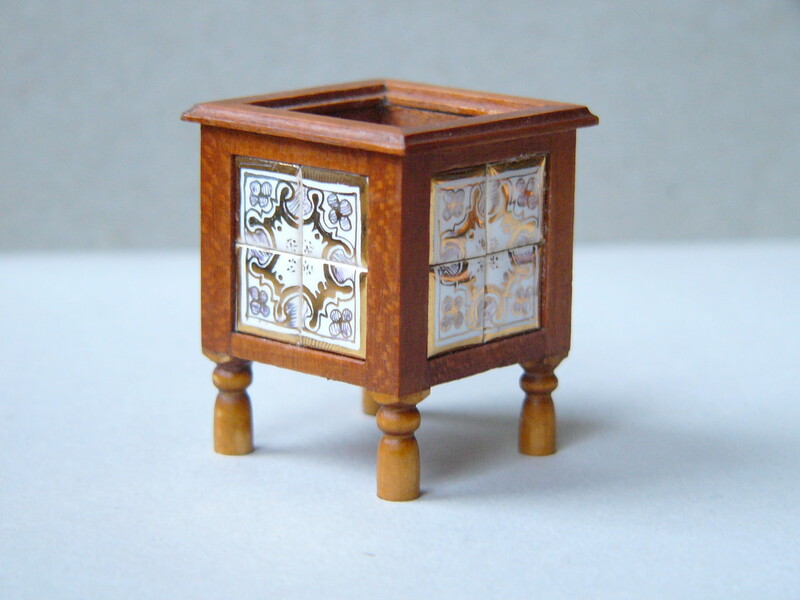 Recently it was exhibited on the miniature fair SIMP in Paris and was admired by the expert public! 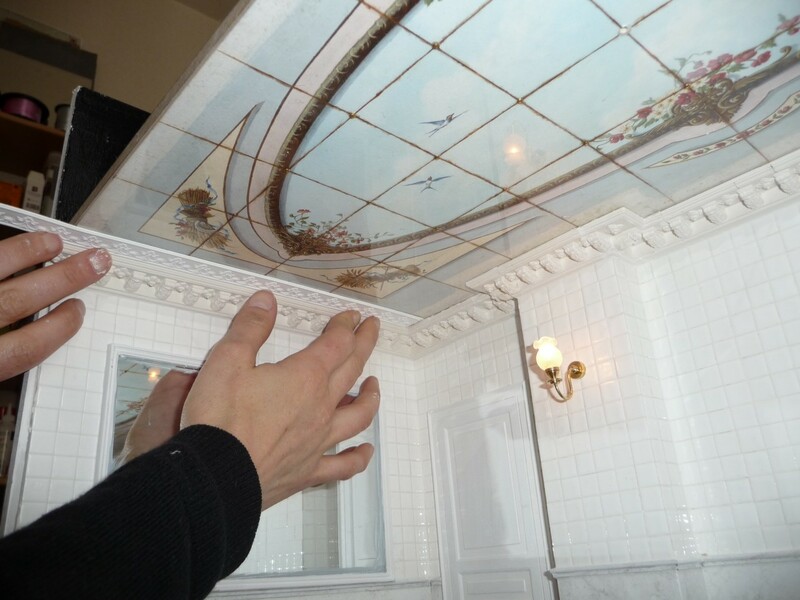 Besides the woodwork, bakery pastries, the wonderful ceiling and all the other details we like to draw your attention to the walls, too. 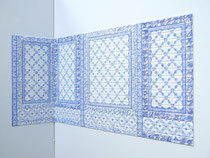 They were covered with a couple of hundreds of our glossy tiles. They were well distributed at the walls, the doors and columns at the back wall in particular! 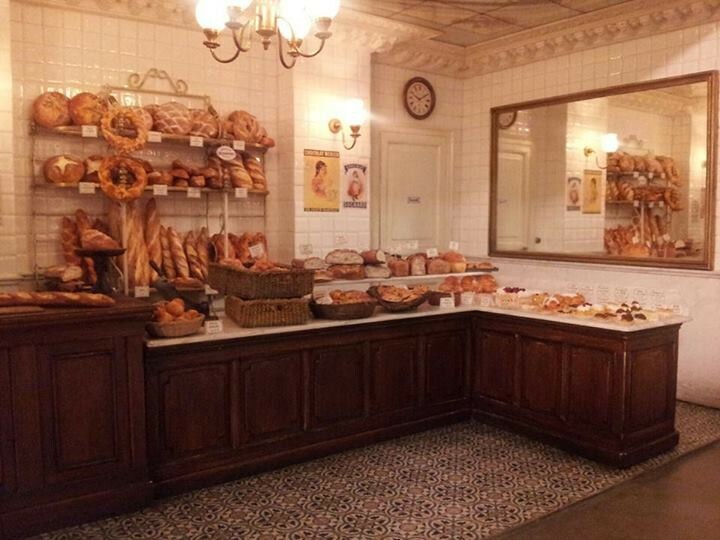 The shop looks very real, as it the bakery would open for the public soon. We appreciate getting the permission to show your bakery here! 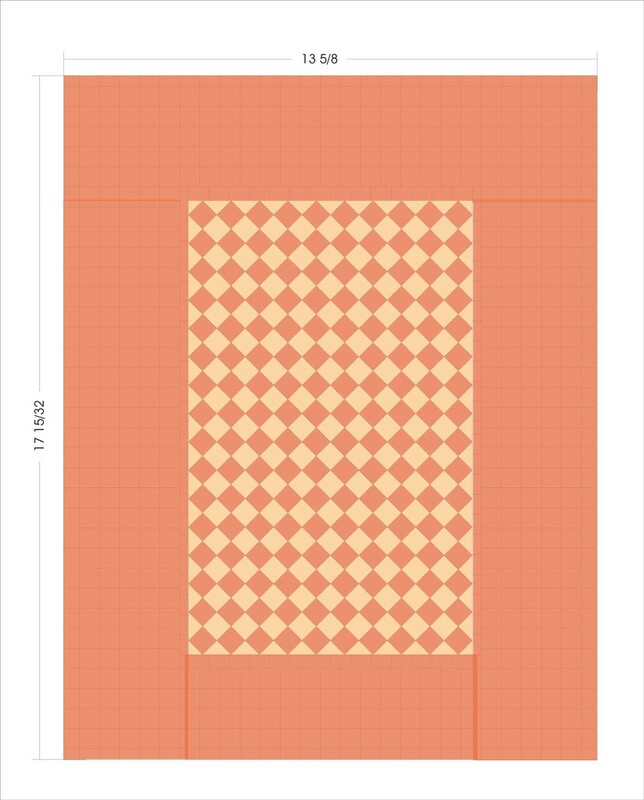 A lady likes to get a floor for a kitchen of 13 5/8''x 17 5/32''. 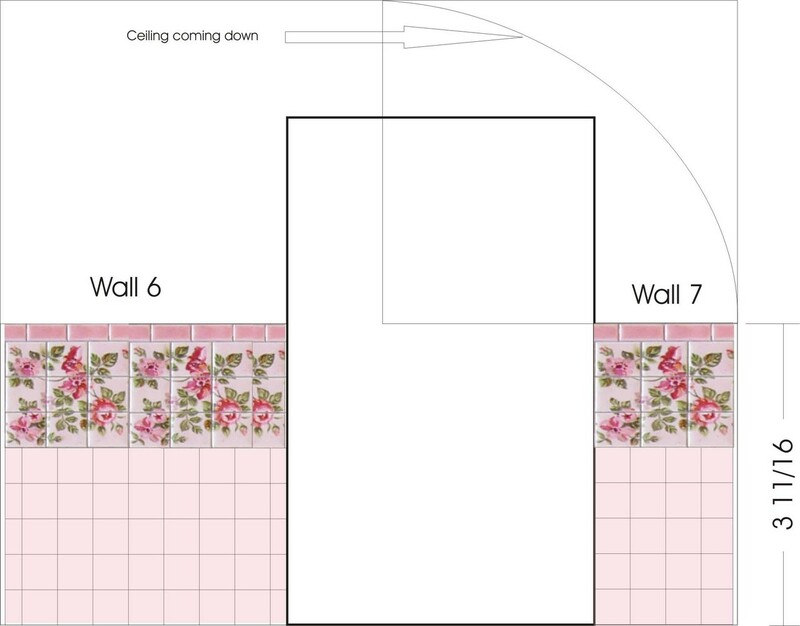 The floor areas near the walls should be quiete as the kitchen furniture will be placed there. A lively centre gives the floor a structure and separates the working area from social area in the centre. 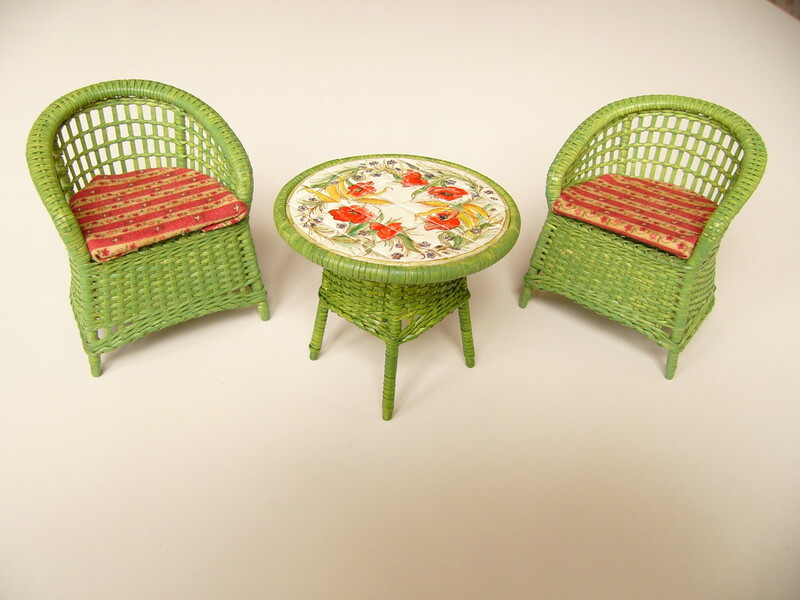 We could imagine a large table in the middle at which the familiy comes together. As you can see different colours change the look. The left floor gives a modern country style look and was the first suggestion. The client likes a more tradtional look but doesn´t like the floor to be too dark. Hence we switched the colours. The working areas at the walls will be in a warm brick red. 3 colour variations are possible for the centre . Find out the differences and and what you like best! What our client selected will be shown as soon as the floor is ready. 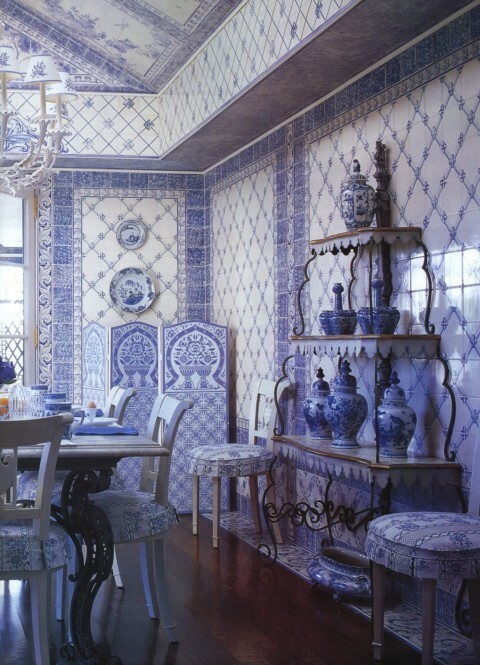 This blues salon has all walls covered with tiles. 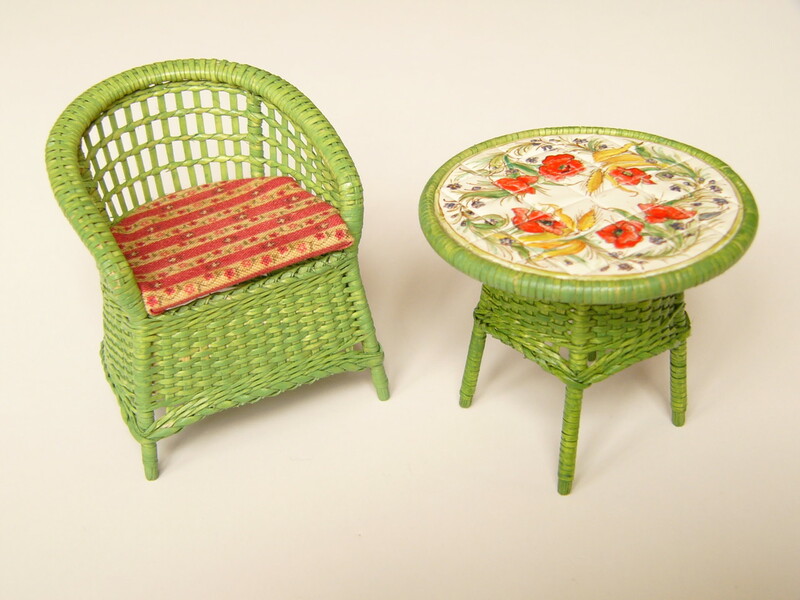 One of our clients likes to make a miniature room accordingly. What a great idea! 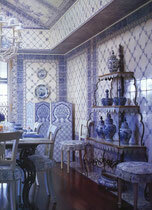 We made the layout of the walls, produced the single tiles, glazed and fired them. 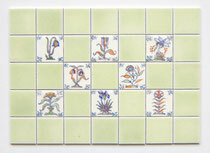 Finally the design was hand painted on each tile and fired again at 780 °C. Horst glued them on the layout paper and now the pieces can easyly be mounted at the walls. The items will find they home in New York and will be shipped within this month! for about 60 years. 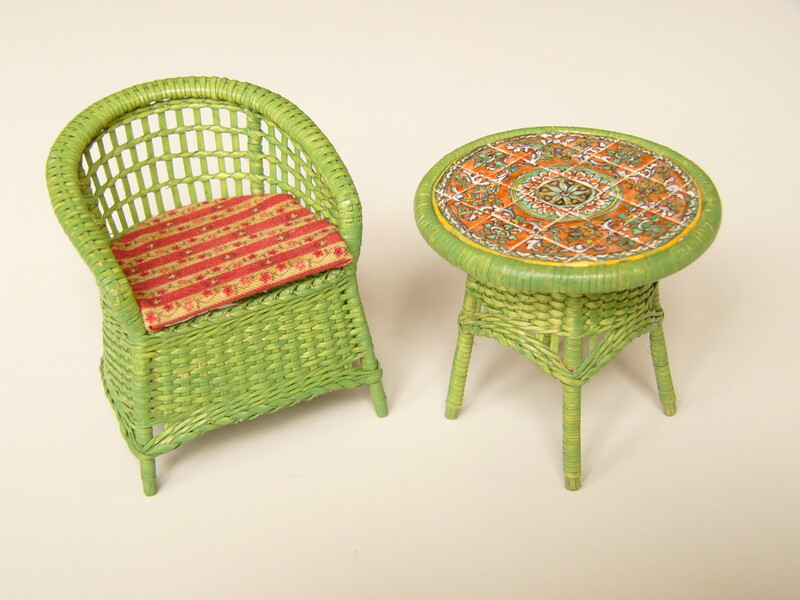 Besides he makes miniature furniture out of real wicker! 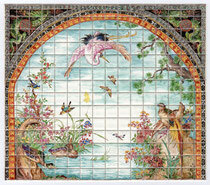 In the section "Wall Mural" we added traditional dutch tile murals. 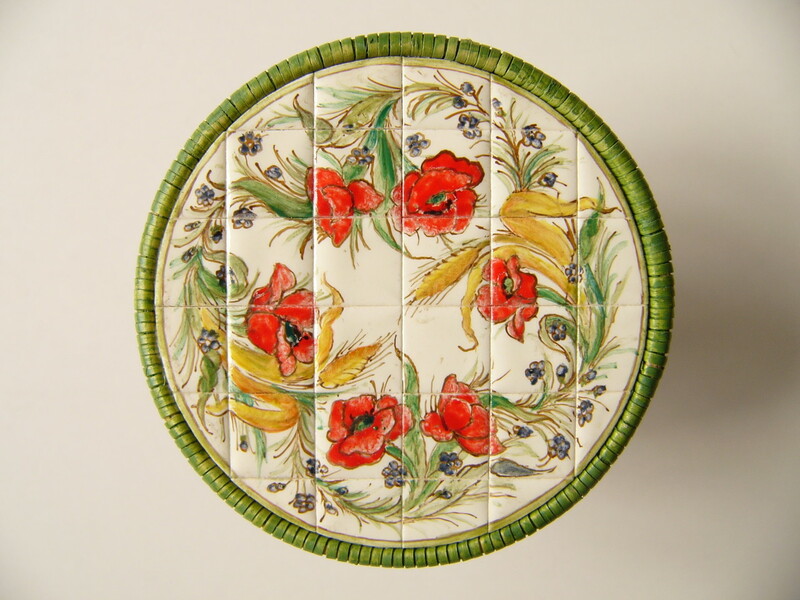 They will look very nice in the kitchen area over the sink or in an entrance hall over a table. The couple can be placed to the left and right of a door. 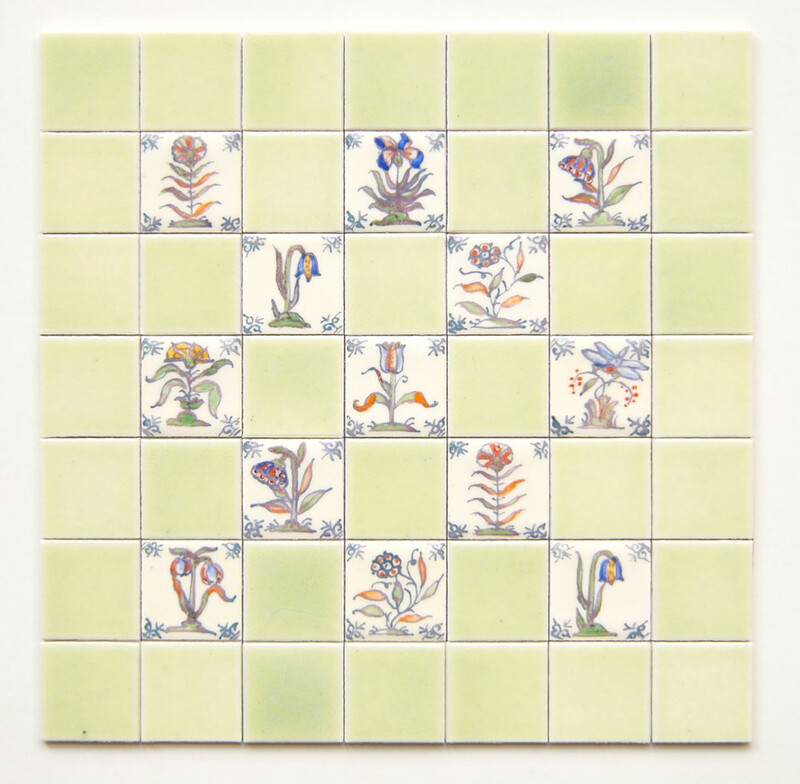 The original tile picture was made by the firm Tichelaar in Makkum 1737. It can be seen in the Rijksmuseum in Amsterdam (NL). The picture shows the interior of the Bolswards tile factory in Friesland (Netherlands). 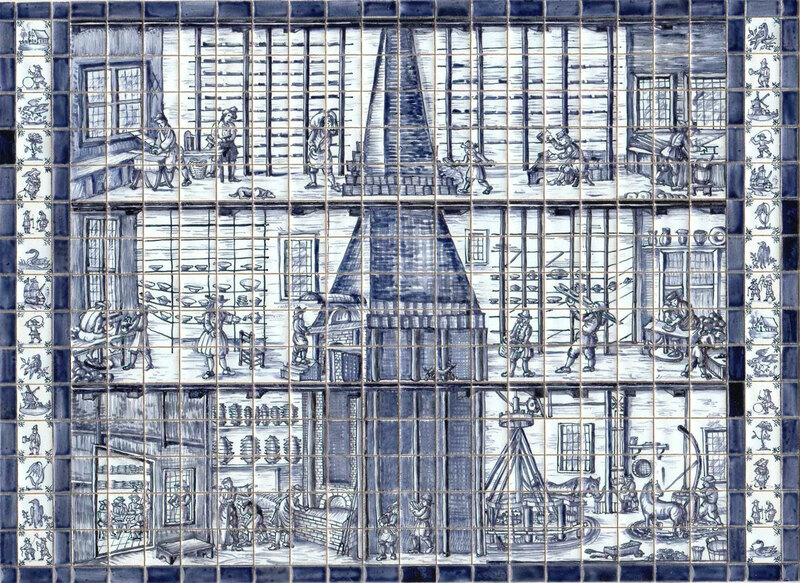 The factory is arranged on 3 floors around the kiln. The clay preparation is being made on the ground floor whereas the production of Delftware pottery is taking place on the first floor. The pieces are drying on shelves at the wall. 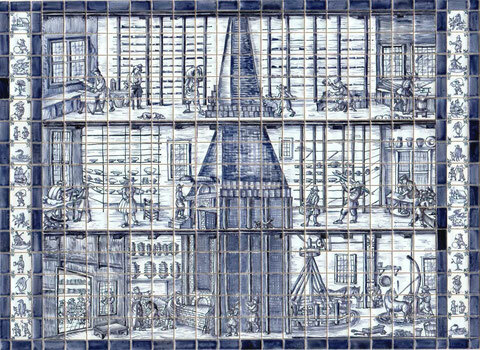 On the top floor workmen are making tiles and stacks of tiles can be seen drying near the kiln. 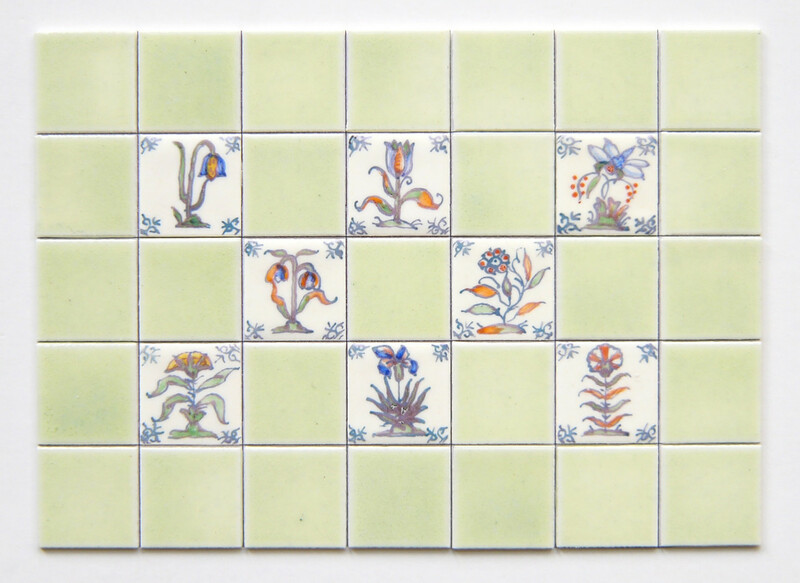 On the miniature tile arrangement two rows of tiles were added in order to show variety of the blue Delftware tiles made at that time.